The Shadow Of The Cat: Return to the City of Khamoon to discover the secret of the strange cat statue. Experience the vast exploration and quick action that made Tomb Raider famous. "The cat statue discovered in the original game triggered off a series of ideas – what if Lara returned to Khamoon to investigate?...what if the ruins had become flooded?...what if the cat statue actually pointed the way to an undiscovered tomb – dedicated to the legendary Egyptian cat-goddesses? – we developed a story with a very strong cat motif, in murals, in hieroglyphics, benevolent cats that guide, malevolent cats out for your blood! Puzzles where developed based on the Egyptian interpretation of the ‘nine lives of the cat’ – so you KNOW that you’re not going to have much luck with Seth’s room!" 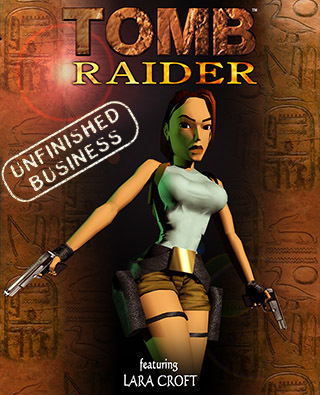 Unfinished Business: After surviving Atlantis, Lara has discovered a ruined segment of the ancient city. Help Lara destroy the alien hatchery before the aliens infest again. "The idea behind 'Unfinished Business' was to create an alternative ending to the game, where Lara would come face to face with an almost overwhelming horde of alien creatures defending the ‘hub’ of their territory... It is pitched as an ‘expert’ challenge, and is intended to be played as a continuation of the original game. A tangible form of alien architecture was created with logical locations and connections, so that the alert player could make informed decisions about where the goals of the levels lay. Transparencies were used everywhere to help generate this ‘sense of place’, and of course to foreshadow future (and often deadly) confrontations!" Discover why millions of people worldwide go adventuring with Lara Croft! Get ready to cross the globe and take on impossible odds while exploring Incan ruins, Ancient Rome, Egyptian Pyramids, and the Lost City of Atlantis in search of the fabled Scion. Includes 4 new levels, all starring the sensational Lara Croft! Experience dramatic new adventures with over 19 levels in all. Choose from a vast of arsenal of weapons including pistols, magnums, a shotgun and uzis.